A pair of tigers were sold from Burghley House in 1888, yet none are listed in the Inventory of 1688. This suggests that they may be later than the 1680s. A similar pair from the China Summer Palace, Drottningholm, belonging to the King of Sweden are illustrated in Soame Jenyns, R, Kakiemon Wares, pl. 10a: TOCS vol. 15, 1937-1938. Two similar pairs are also illustrated in Nihon Toji Taikei, vol. 20, Kakiemon, pl. 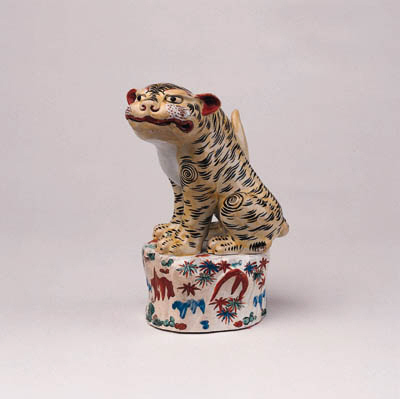 87, and in Porcelain for Palaces, The Fashion for Japan in Europe (1650-1750), pl. 168. Another almost identical tiger is illustrated by Hideo Kurita, Imari, (Kurita Museum, 1975), pl. 8. Kurita suggests that this was made by special order of the Dutch East India Company which exported it to Western Europe during the Kanbun period (1661-1672). Four similar pairs sold in these Rooms on 19 July 1965, lot 96, 18 February 1975, lot 78, 25 April 1978, lot 52 and 9 March 1987, lot 338, from the collection of H.R.H. The Late Duchess of Kent.